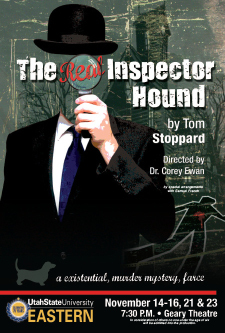 Eastern Utah Theatre’s second production “The Real Inspector Hound” follows two theatre critics who are watching a ludicrous setup of a country house murder mystery, in the style of a whodunit. By chance, they become involved in the action causing a series of events that parallel the play they are watching. Directed by Corey Ewan, Ph.D., the short, one-act play by Tom Stoppard opens three weeks after Zombie Prom closed, with a “brisk” rehearsal period that will put the college actors through their paces as they ready for the Nov. 14 opening night. Hound tells the story of two feuding theatre critics, Moon and Birdboot, the first is a pompous and vindictive second stringer, the second, a stuffy philanderer, who are swept into the whodunit they are viewing. In the tradition of Agatha Christie melodramas, fog envelops a group of people trapped in isolated Muldoon manor with a body hidden under a sofa, the arrival of a suspicious young man connected to the ladies in the house and the arrival of an inspector from Scotland Yard. As mists rise around these potential victims, Moon and Birdboot become dangerously implicated in the lethal activities of an escaped madman. The cast is comprised of Eastern Utah Theatre veterans Braden Nelson, Josh Bone and Joshua-David Zelasko, as well as talented freshman, Mackylin Rowe from Liberty Preparatory Academy, Jennifer Thomas of Granger High School, Josie Slade from Orem High School and Lesly Gaona from Pinevivew High School. The play is presented in the Geary Theatre at 7:30 p.m. on Nov. 14, 15, 16, 21, 22, 23.